Unit Plan Sizes: 1,460 - 2,677 sq. ft. 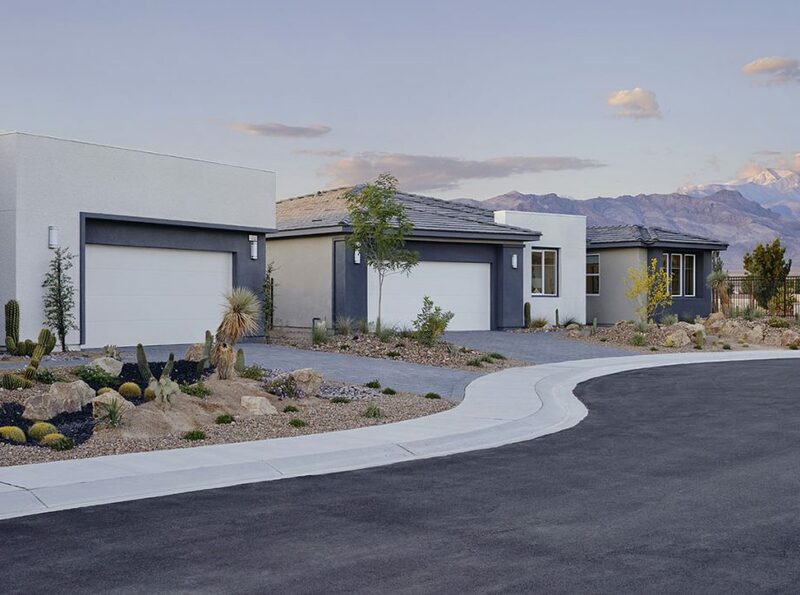 These new single-level homes feature contemporary desert architecture using materials that can withstand the temperatures of the Nevada desert. The design seamlessly integrates with the surrounding natural landscape and is a departure from the Tuscan architectural style that dominates the surrounding communities. With no existing lot lines KTGY was able to create three distinct product lines that lived well and then determine lot sizes. This enabled KTGY to create highly livable plans while maximizing lot yield. Open plans, clean lines, and thoughtful orientation to nature, views and outdoor living all promote timelessness of the designs. Universal Design features like owner’s entry, walk in showers and domestic suite adjacent to master bath/closet make these homes perfect for the 55+ age qualified buyer. The club house shape takes advantage of views to the mountains, the fairway and the waterfalls on the finishing hole and encompasses nearly 17,000 square-feet of conditioned space. 4767 E. Cactus Canyon Dr.